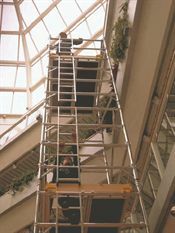 An ideal access solution for those jobs where a ladder is not sufficient. Easy to erect and include castors inorder that the tower may be easily moved when erected. The single width tower (0.85m wide) provides a stable and safe platform to work upon.